Give cupcakes and cakes an elegant look with pure white buttercream frosting. 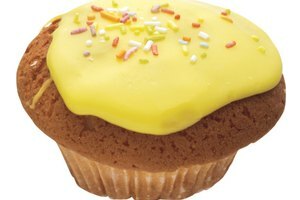 Classic buttercream frosting has a pale beige tint because of the yellow of the butter and the brown color of vanilla extract. To keep the color pure, use vegetable shortening and clear vanilla extract. Adding white food coloring also helps the frosting stay as pristine looking as fresh snow. This recipe is adapted from ones by Wilton and The Kitchen Magpie. Sift the icing sugar into a medium-sized bowl, using a metal sieve. Ensure there are no clumps of sugar. Add the icing sugar gradually, a 1/2 cup at a time. Beat the frosting continuously on medium speed. Push down any excess frosting or shortening from the sides of the mixing bowl with a rubber spatula. As more sugar is added, the frosting will appear dry. This is expected. Continue beating on medium speed after all of the sugar has been added. Add the milk gradually, a 1/2 teaspoon at a time, thinning the frosting to the desired consistency. Beat the frosting on medium speed until it is light and fluffy. Use the frosting immediately or cover with plastic wrap and store in a cool location until ready to use. For stiffer, less spreadable frosting, reduce the milk by half or omit it entirely. For a richer, buttery taste, add 1/2 to 1 teaspoon of no-color butter flavoring. Add the flavoring along with the vanilla extract. 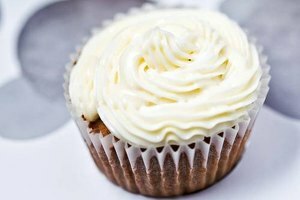 For butter-only or a half butter, half shortening frosting, increase the amount of white food coloring used by 3 to 4 drops. Allow the frosting to rest 60 minutes before using, as the color will deepen the longer the frosting rests for.